It has already been such a busy week for us. We have been inundated with last minute orders for sweet and chocolate trees.� Sweet Creations had been very privileged this week to be asked at the day before to create 6 large lolly sweet trees in there signature colours of red, green, yellow and blue. There is never a dull moment in the office where we can get the sweet trees made in a slow and relaxing way, but we wouldn't have it any other way.� Working like this show how quick and efficiently we can turn a job around. It made a change to make different lolly sweet trees instead of the usual Chupa Chup ones, they look so bright and colourful. Now the team need to finish off the next large order of 39 sweet trees that are going to be delivered to the Dorchester Hotel in London today I will post some photos of this later in in the week. � In the mean time you can have a look at one of the sweet trees we have done for Google. What an amazing week for Sweet Creations, we started the week with a sweet trees job for Google, followed by another large order for the Variety Club at the Dorchester Hotel in London. and to finish the week off we had a large order of very elegant sweet trees for a Lacoste product launch at the Science Museum. When we deliver jobs like this to a museum we have such limited time to set up and be out.� It can be very stressful, our staff worked very quickly and efficiently, as one was unwrapping them another was placing them on the tables. Lacoste had ordered very elegant white marshmallow�sweet trees with watermelon bonbons in the base. The poles and ribbons were matched to their company colours. We have been told that the evening was a success and the staff and buyers loved the sweet trees. When our vases were collected there was not a sweet left in sight. I have attached a picture of the sweet tree for you to see. What a crazy week we had last week, we all worked so many hours to get all the sweet trees made to perfection. We started the week with lots of gift bookings for Fathers day, it seems to me that lots of dads like Ferrero Rochers and Liquorice Allsorts. I hope that all you dads enjoyed your sugar rush. 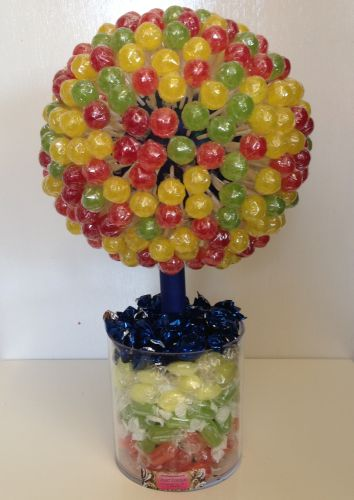 On wednesday we had a large corporate re-booking for some green, blue and black multi sweet trees. Each tree had bonbons, jelly sweets, apple cubes & jelly beans etc. They just looked fab its was so nice to work with some different colours for a change.� They were loved by all and cant wait to book us for next year. On Thursday we starting the mammoth job of making two 6ft�sweet trees for a wedding in Chester. The bride and groom had chosen to have multi trees.� The top of the was a huge ball of thousands of sweets at sat on a long stem which we dressed in beautiful white ribbon and organza bows.� We planted the tress in long glass vases filled with sweets.� They looked so elegent sitting in the wedding reception room of a beautiful castle. we managed to do all this and get it delivered by friday afternoon. Then came a massive job for a Batmitzvah party at the Mayfair hotel on Saturday.� Every table was filled with sweets.� Each adult table had a 70cm tall flying saucer sweet tree with bonbons and millions in the base for the centre piece. The children's table had 3 large haribo mixed sweet trees all with matching bases to the adult tables. The Batmitzvah girls table was just amazing we made her a name Charlotte in sweet trees across the long table.� Her parents decided to surprise her with one of our outrageous creations of a 3 tiered chocolate sweet cake. each tier had a different chocolate with a big edible bow on the top.� Everyone went crazy for them.